After weeks of street protests across Spain to demand an increase in retirement pensions and a revamp of the way in which pensions are calculated, Spanish President Mariano Rajoy of the governing Partido Popular (PP) dug in his heels today, saying the only way to raise pensions is to reach an agreement to pass the government’s 2018 budget that has been stalled for months in Congress. Speaking during a congressional plenary session called to discuss the pensions issue, Rajoy said if other parties would agree to approve the budget he would propose a raise in the lowest pensions, a tax break for pensioners and dependents, and a rise in pensions for minimum-wage earners and widows. The proposals fall far short of the demands of pensioners backed by Spain’s largest trade-union federations, who have taken to the streets across Spain to demand the government peg annual pension increases to inflationary growth of the consumer price index. Those demands plus a repeal of reforms agreed unilaterally by the PP absolute majority in Congress in 2013 have also been called for by Rajoy’s left-of-centre political opposition, the Socialist party (PSOE) and Podemos . Rajoy laid down very clear red lines in his speech to Congress, saying he will not give in to demands to modify the 2013 measures that the opposition parties and labour unions say have contributed to a dramatic decrease in the real value of retirement pensions. Nor, he said, would he consider earlier 2011 changes to pension laws that pushed back the legal retirement age from 65 to 67 years. Rajoy was excoriated in responses by Socialist party spokesperson Margarita Robles and Podemos general secretary Pablo Iglesias. Robles accused Rajoy of having “burdened pensioners with the weight of (Spain’s economic) crisis” and gutting the federal pension fund with his government’s policies, noting that fund was flush with 66 million euros in reserves when former Socialist president José Luis Rodríguez Zapatero left office in 2011, but now stands depleted with only 8 million euros after Rajoy’s seven years in office. Iglesias slammed Rajoy for saying there is no money available to increase retirement pensions: “It’s not true — 2 billion euros have been spent to bail out the highways and that’s exactly what it would cost to revalue the pensions”. 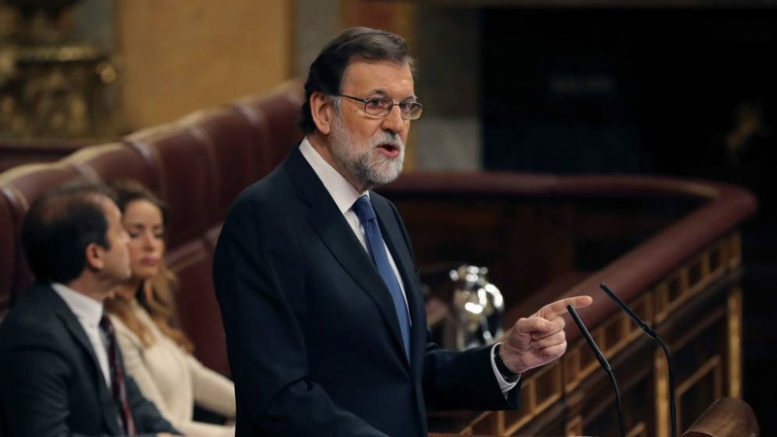 Rajoy’s decision to peg even a minimal rise in pension levels to the 2018 budget approval is a gambit that may not meet with success, given the refusal so far of the regional Partido Nacionalista Vasco (PNV) party to lend its critical six votes of support because of differences with Rajoy over his imposition of home rule from Madrid on Catalonia over that region’s bid for independence from Spain. Given Rajoy’s intransigence today, the pressure to raise pension levels and rollback the PP government’s changes to the pension system will move from Congress back into the streets, where the mobilizations begin anew on Saturday, with pensioners, labour unions, the PSOE, Podemos and other political parties out in force, demonstrating in marches and rallies slated in hundreds of cities nationwide.